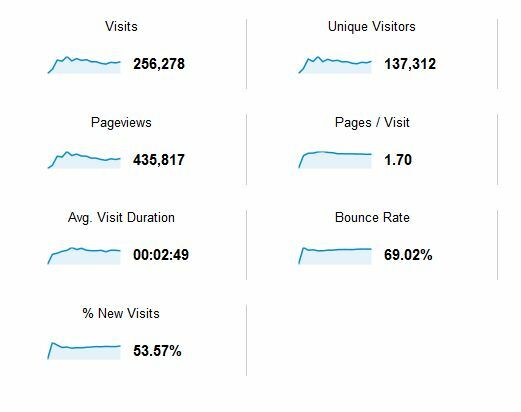 I had productive months and I had slow months in terms of posting new content – but the traffic was surprisingly stable throughout. For a total of just north of a quarter of a million views – 256.278. Search traffic picked up slower and reached a stable enough level around April 2012. At the end of the second year, search made up exactly 50% of the total number of visits in 2011 and 2102. This percentage has recently gone up significantly in 2013, to about 65%. This data in particular is very actionable in terms of traffic size and quality – it’s main takeaway is which are the major sites that driver the most and the best kind of traffic. This should lead into putting more effort into some sites and less in other. For example, it’s easy to spot that reddit does drive quite a lot of traffic, but the quality of that traffic is usually low for a technical blog. Hackernews falls into the same bucket – good amount of traffic, but low quality overall (which is to be expected). So what’s the point of all this? For me, the point is learning – I’m opening up these stats to learn more about how I might improve them going forward. It is also my hope that others will find them not only interesting, but practically useful and actionable.